I think John Key might have just won the election. Just watching John Key on Breakfast with Alison Mau he was devastatingly savage on highlighting Clarks omission and played up Owen Glenns significance to Labour as counters to Clarks need to be fair to her Minister. If Helen is unable to pull something out of the bag today, this will stick. If I were Helen I'd go to the public today saying that the ETS was vital legislation, so vital that you will take the issue of sustainability to the electorate when you announce the election rather than rely on NZ First support which when considering the full revelations of late would undermine the credibility of this Parliament. If she doesn't pull something really good out, I think Winston's demise could well infect Helen. Phil Goff just got two steps closer to being the leader of Labour in 2009. If I was Helen i'd wait till November 8. You got tax cuts starting in a month, You will have passed your ETS, and there will be time to claw back a lead. On current polls National are almost governing alone. 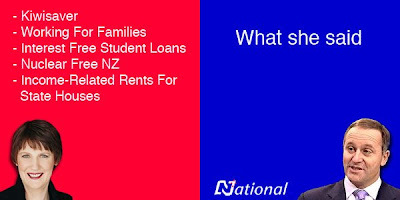 National say they are going to have an ETS (and yes the devil is in the detail) so there is little to distinguish the parties. Why would she call an election so far behind in the polls? If she calls an election, she ends the priviledges committee hearing (which looks like she is covering for Winnie) and the matter is fresh in peoples mind. I still think Labour has more chance the further away the election is. You are right, I'm not suggesting a snap election, just that she will put the ETS to the electorate to get a mandate. I think she will pass it. It was their major goal for the year, and to not achieve it might be seen as a failure. When are Labour going to play the so called 'neutron bomb'? Hooten mentioned it last weekend in his column, but I am wondering when what else Key had to say at the cocktail party will surface, will it all be put out in the 6 weeks of the election. So its an 'October Surprise'? I wonder why so many people say there are no more issues of confidence and supply to be faced by this government? A motion of No Confidence can, as I understand Mr McGee, be proposed at any time and is quite normal when their 'majority' is thought to be gone! Strikes me we could have on as soon as next Tuesday! Followed by a disolution by the GG. That would, to a greatextent, suit Mr. Peters, who needs to not only avoid a SFO prosecution but also a PSC censure if he is to have ANY future in NZ Politics. "6.55 In some cases, the confidence of the House may be unclear, for example, in the case of a change in coalition arrangements. The incumbent government will need to clarify where the confidence of the House lies, within a short time frame (allowing a reasonable period for negotiation and reorganisation). The caretaker convention applies in the mid-term context only when it becomes clear that the government has lost the confidence of the House." Where is LOL and the child? Shouldn't they be here crowing about Labour's 37% in the polls and the massive sea change that's about to happen? I'd hope that most people who don't vote for Peters wouldn't waste too much time on the Peters thing one way or the other. It simply isn't relevant to them (or me, being one of them). Clark isn't reposnsible for what Peters does any more than Shipley was reposnsible for what Alamein Kopu did. I'd hope no thinking person would determine a vote for any party OTHER than NZ First based on anything Peters did or didn't do. Riiiiiiight, because Alamain Kopu was Shiply's Minister of Foreign Affairs. Yeah you keep hoping, that's all you have left after Helen has tarred herself with winson's lies. So hey Truth, do you think its OK for our Prime Minister to stand at the sidelines and say nothing while her Foreign Minister tells what she knows to be lies to the NZ public? Is that OK ever from anywhere on the political spectrum? Do you really 'seek' 'truth' ? then the opposition had to seek leave (one objection would sink it). support of the House of Representatives. they should be already this close to an election). worth remembering that Parliament expires in just over a month anyway. Governor-general to dissolve Parliament and call an early election.